Thanks to Ben we now know of yet another sale today. 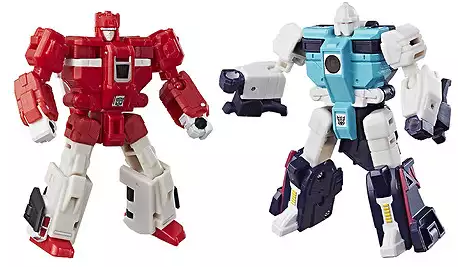 Transformers Generations Clones 2-figure Pack with Cloudraker and Wingspan is now 35% off on Walgreens.com. The set was originally listed at 19.99 but is being sold for 12.99. This set is a Walgreens exclusive although in store prices may vary from this sale on the website. Octone is going to $12.99 on HasbroToyShop. That's 48% off and eligible for free shipping. It's hard for me to justify getting this two-pack if I can't get their clones easily. Thanks to fellow Seibertronian, hushed we now know that Power of the Primes Voyager Class Starscream is 25% off on Amazon. This figure was originally listed for 24.99 but now costs 18.67. This figure includes the Seeker enigma, two prime armor accessories (which are essentially combiner feet) and he also comes equipped with his signature null-rays. Power of the Primes Starscream is very similar to Combiner Wars Starscream in a lot of ways. If you would like to check out a pictorial reveiw of this figure, click here. There are a lot of great comparison photos so that you can get a good look at the figure before purchasing it. Good luck and happy hunting! Probably will. I'm glad I didn't buy it full price at Walmart the two times I've seen him there, I feel kinda bad for whoever did. I got mine off Amazon for $19.66, I think anything over $20 is too much. He's currently $18.47 so the price is still sliding down and that is the Amazon price, not a third-party seller's price. Doesn't help that he doesn't have a team to go with him, All of the Dinobots are selling high, especially Grimlock starting at $43 and Slash at $19 (neither one available through Amazon directly). I know a lot of people don't like Grimlock, but having a team really helped him sell compared to Starscream. 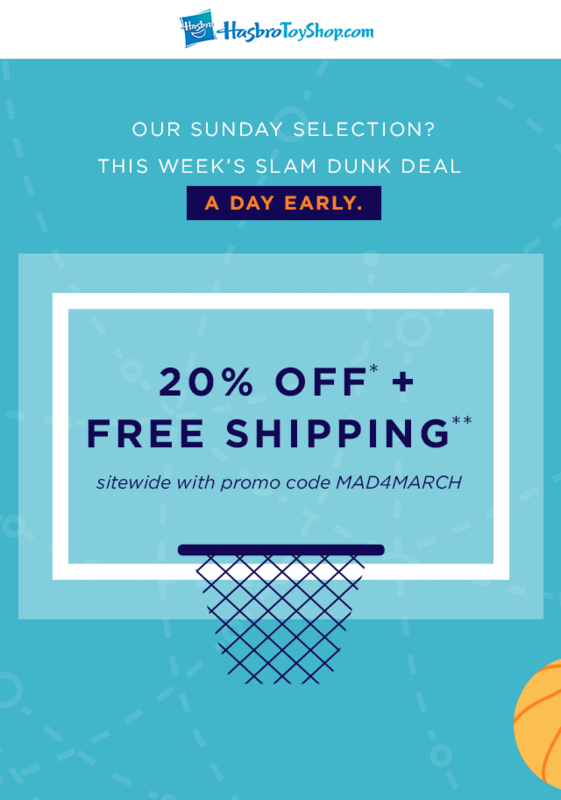 Aside from the current "unplug" 15% discount with code UNPLUG18, there's now also a sitewide 20% off + free shipping at HTS with code MAD4MARCH! Back to where voyager prices should be. Fellow Seibertronian Sjeng has spotted another deal over on the official Hasbro site - the Hasbro Toy Shop site, that is - along with the current eBay store sale. The code to use is MAD4MARCH which will give you a 20% discount sitewide, and will be running until midnight on March 17th, which also means that until midnight tonight (March 11th) it will be running alongside the UNPLUG18 deal of 15% discount - though promotional codes cannot be combined, of course. Sjeng wrote: Another discount newsflash! 15% off most products currently for sale in the action figures, games, & playsets categories on HasbroToyShop.com through March 11, 2018 at 11:59 p.m. ET. with promo code UNPLUG18. Discount applies to pre-tax and pre-shipping amount. This offer cannot be combined with any other offer. Excludes HasbroToyShop.com exclusives and gift cards. While supplies last. No rain checks. Not valid on previous orders. Subject to terms and conditions of use and HasbroToyShop.com policies. ©2018 Hasbro. All Rights Reserved. Yay! Hun-Grrr says ADD TO CART. When I click on him it says OUT OF STOCK. Don't think I've ordered anything from that site since 2016. Navigating through it to reach a specific type of TF line use to be so simple. But that's not really that big of a deal since they don't ever having anything worth a crap until 3 months after everywhere else on the planet gets second shipments of something "new" anyway. You'd think that with TRU going belly up soon that "Hasbro" would step their game up suply and demand especially with exclusives (lord knows how much we hate searching for exclusives at Walgreens). H3ll, why don't they just step in and buy TRU??? Ordering from HTS has been a nightmare since I discovered it in 2012. Half the time I have to order as a new customer for it to process, and even then they never have a good supply of Transformers. Most of the time you are better off ordering from a 3rd party site like BBTS or TFSource. But if I visit the Philippines with my wife the shelves are covered from top to bottom with all the toys of the line, even TR Ramhorn and the TR Boxsets that were hard to find. As an american company they do not seem to give priority to it's home country in terms of stock. WreckerJack wrote: If you would like to check out a pictorial reveiw of this figure, click here. There are a lot of great comparison photos so that you can get a good look at the figure before purchasing it. Good luck and happy hunting! 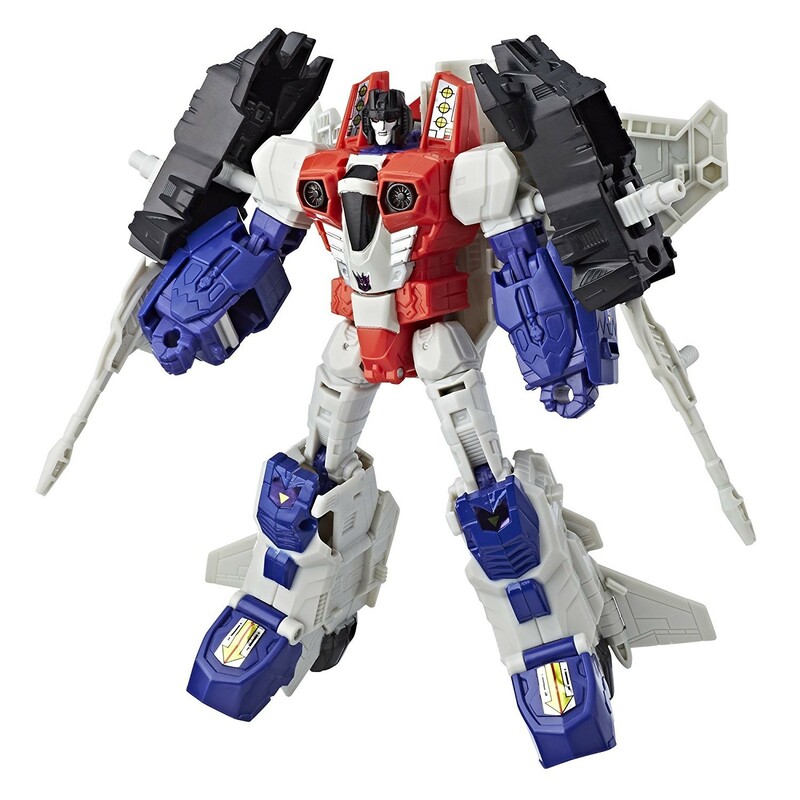 WreckerJack wrote: Thanks to fellow Seibertronian, hushed we now know that Power of the Primes Voyager Class Starscream is 25% off on Amazon. This figure was originally listed for 24.99 but now costs 18.67. This figure includes the Seeker enigma, two prime armor accessories (which are essentially combiner feet) and he also comes equipped with his signature null-rays. Power of the Primes Starscream is very similar to Combiner Wars Starscream in a lot of ways. If you would like to check out a pictorial reveiw of this figure, click here. There are a lot of great comparison photos so that you can get a good look at the figure before purchasing it. Good luck and happy hunting! Still really not enough of a discount for me to get him. Maybe if he ever drops to $10 & by some miracle Takara produces a Hydra & Buster 2 pack that I could team with Dreadwind & Blackwing to complete a set of limbs for a combiner......still a maybe. I've been making customs out of those shelf-warming Starscreams (with a Skywarp, my prototype, coming up soon) but sadly, those online discount are cancelled-out by shipping making it roughly what I'd buy in stores anyway. What a shame. Skritz wrote: I've been making customs out of those shelf-warming Starscreams (with a Skywarp, my prototype, coming up soon) but sadly, those online discount are cancelled-out by shipping making it roughly what I'd buy in stores anyway. What a shame. Could always pick up a prime master or some snacks to make free shipping. True. I'm also probably the only weirdo in a fanbase of weirdoes who is army-building out of one of the worst Voyager-sized molds in recent years. Or so I'm told it is. Skritz wrote: True. I'm also probably the only weirdo in a fanbase of weirdoes who is army-building out of one of the worst Voyager-sized molds in recent years. Or so I'm told it is. It's okay to like something that others don't. You don't need anyone's approval to collect what you enjoy. I think everyone has unpopular opinions about certain figures to some degree.